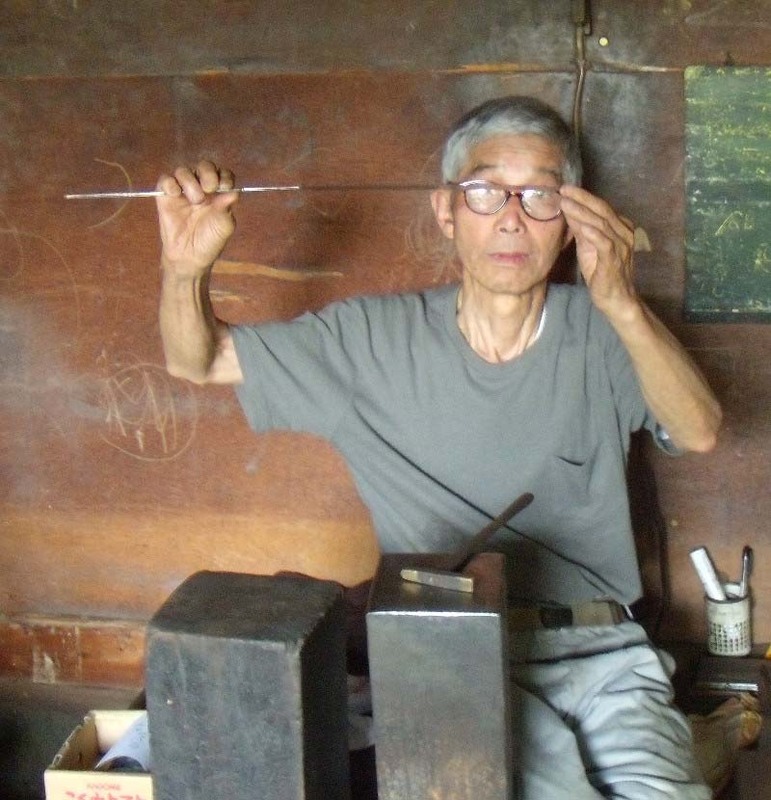 Shinsui Nakaya started his apprenticeship as a blacksmith, specializing in saws, when he was only 15 years old. After more then 10 years as an apprentice, he founded his own saw manufactory at the age of 26. Now at the age of 76, he can look back at 62 years of experience in saw making. Shinsui Nakaya works and lives in Sanjo in the province of Niigata. Traditionally, the name of the Master will be used in one form or another when starting a new manufactory. Shinsui Nakaya decided that after 10 years of apprenticeship he did not need his Master in any form, name or advice, and has been using only his name since the manufactory was founded more then 50 years ago. He developed his own oil-based method of hardening the metal; that reduces the risk of cracks and deformation significantly. Top picture: Shinsui Nakaya checks the straightness of a saw blade. 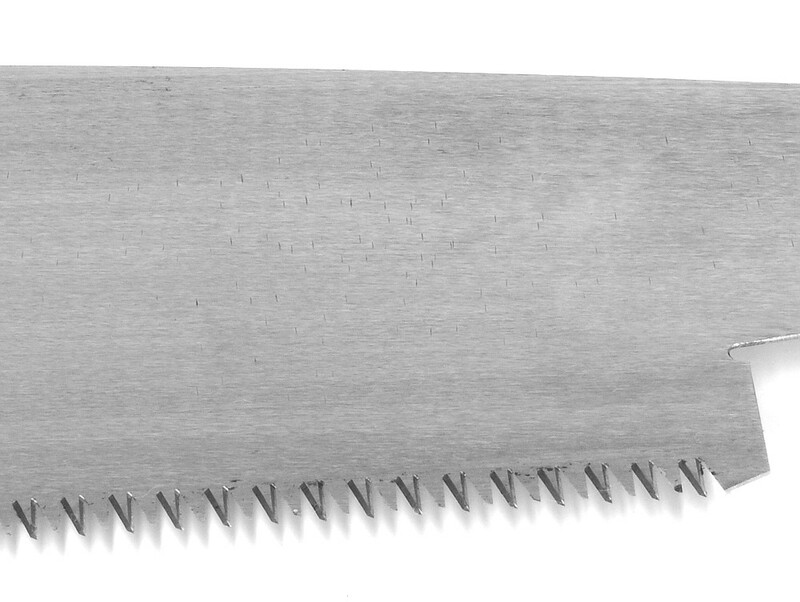 Bottom picture: The saw blade shows clearly marks from the hammer that straightened the tool blade. Hand made, blade forged, each blade straighted individually. One teeth row for crosscut, one theeth row for ripcut. Hand made, blade forged, each blade straighted individually. Teeth are filded for crosscut. Hand made, blade forged, each blade straighted individually. 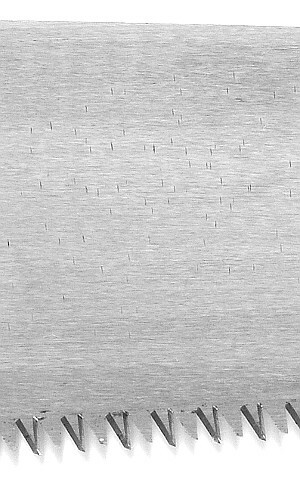 One teeth row for crosscut, one teeth row for ripcut.